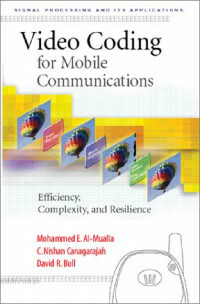 This book concentrates on three main challenges of video coding for mobile communications: higher coding efficiency, reduced computational complexity, and improved error resilience. Unlike other high level books and articles that focus on individual aspects in this field, this book has been designed as a quick, easy, and practical introduction to all of the fundamentals and standards of video source coding. will be of particular interest to the thousands of engineers and computer scientists who are working to link our global economy through mobile multimedia communications. In order for wireless devices to function, the signals must be coded in standard ways so that the sender and the receiver can communicate. This area of video source coding is one of the key challenges in the worldwide push to deliver full video communications over wireless devices. This important new book reviews current progress in this field and looks at how to solve some of the most important technology issues in the months and years ahead. The vision of being able to communicate from anywhere, at any time, and with any type of information is on its way to becoming reality. This natural convergence of mobile communications and multimedia is a field that is expected to achieve unprecedented growth and commercial success. Current wireless communication devices support a number of basic multimedia services (voice, messages, basic internet access), but have coding problems that need to be solved before "real-time" mobile video communication can be achieved. Nishan Canagarajah, Ph.D., has been a lecturer in Digital Signal Processing at Bristol since March 1994. Prior to this he was employed as a Research Assistant at Bristol investigating DSP aspects of mobile radio receivers. He has a BA in engineering and a Ph.D., both from the University of Cambridge. His current research interests include image and video coding, speech processing, non-linear filtering techniques and the application of signal processing to medical electronics. He has worked closely with several companies in the fields of signal processing and image coding and has published numerous journal and conference papers in these areas. Dr. Canagarajah is actively involved in the UK VCE in Digital Broadcasting and Multimedia Technology. He is a member of IEE Professional Group E5 (Signal Processing). David Bull is Professor of Signal Processing and Deputy Director of the Centre for Communications Research at the University of Bristol, UK. He leads the Image Communications Group in the Centre for Communications Research at Bristol and is also Deputy Directory of the CCR. Prior to taking up his post at Bristol in 1992 he was an Electronic Systems Engineer at Rolls Royce and subsequently a University Lecturer at The University of Wales. He has worked widely in the fields of 1 and 2-D signal processing and has published over 150 papers in these areas. He has received two premium awards for his research papers and holds several patents. He is currently a Director of the Virtual Centre of Excellence in Digital Broadcasting and Multimedia Technology and is also a member of the Programme Management Committee for the EPSRC/DTI LINK program in Broadcast Technology. Android is a software toolkit for mobile phones, created by Google and the Open Handset Alliance. It's inside millions of cell phones and other mobile devices, making Android a major platform for application developers. That could be your own program running on all those devices. This book is meant to help the reader learn how to program in C. It is the definitive reference guide, now in a second edition. Although the first edition was written in 1978, it continues to be a worldwide best-seller. This second edition brings the classic original up to date to include the ANSI standard.